We had a tragic case come into Leith Toy Hospital recently, of a sweet little stuffed bunny who had been mauled by a dog. He was all full of holes, and his arms were nearly chewed off. He required urgent care to be put back together, and ended up with a dashing new suit into the bargain! 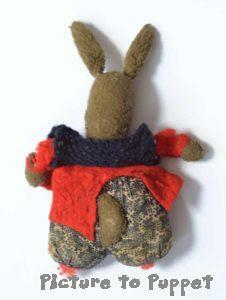 When we took a close look at the bunny, it was apparent that he would need a lot of repair work. The bottom half was all full of holes, and the stuffing was coming out. As a side note, it’s always interesting to see the variety of stuffing materials when we do soft toy repairs; this one appeared to be stuffed with old thread and fabric scraps. It was pretty and colourful, but stuffing should be on the inside, not the outside! The felt coat was all pulled out of shape, and the arms were almost falling off. 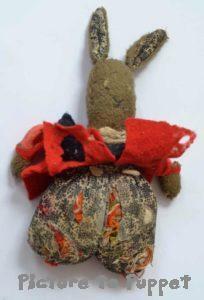 All the clothing fabric was old and fragile, but the bunny’s face was pretty intact. The ears just needed a few reinforcing stitches, but it was otherwise fine. In cases where the toy’s covering fabric is lacking structural integrity, we can make a new ‘skin’ to fit on top, leaving the original intact and trying to replicate its appearance as closely as possible. 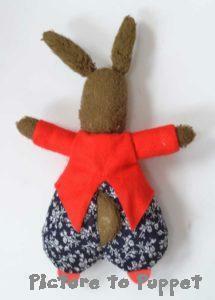 We made little dungarees for the bunny, with fabric chosen by the client, and added new felt feet. We sewed this ensemble down on top of the original to protect it. 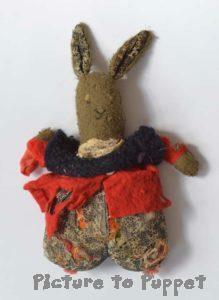 Bunny with new dungarees. You can see how the arms are attached to the coat rather than the body. 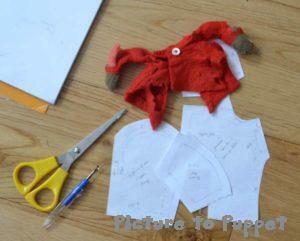 We copied the pattern of the original coat, and cut a new one out of smart red felt. The bunny’s arms were actually made together with the coat, so we sewed the coat on so it wouldn’t lose them, saving the button from the old coat. The finishing touch was a little lace cravat, made from what was originally bridal lace. Tiny little pattern for a bunny suit! This bunny was a fun patient to work on, because he was clearly a one-of-a-kind creation. We wanted to make sure to preserve his unique appearance, while fixing all the dog-inflicted damage. By working with the client to match the fabrics as closely as possible, we were able to keep bunny recognisable, but with new fabrics that were much sturdier. 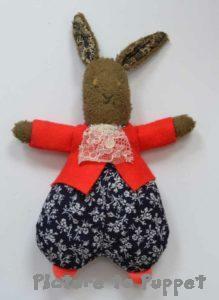 It was a fun design challenge to replicate the garments, and we think bunny turned out looking very dapper! If you’ve experienced the classic “The dog ate my stuffed toy” disaster or your childhood favourite is just looking the worse for wear, we at Leith Toy Hospital would be happy to restore it to good condition! We serve as a teddy bear hospital, doll hospital, and do any other soft toy repairs you can imagine. 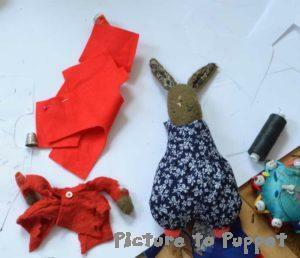 As Picture to Puppet, we make soft toys all day, so we’re expert at repairing old teddy bears and other stuffed animal repairs. We’re available for drop-in patients if you need a toy hospital in Edinburgh, and you can also post us your poorly teddy and we’ll send it back good as new! Find more information and a price list here. Get in touch for a quote, or stop by our studio!